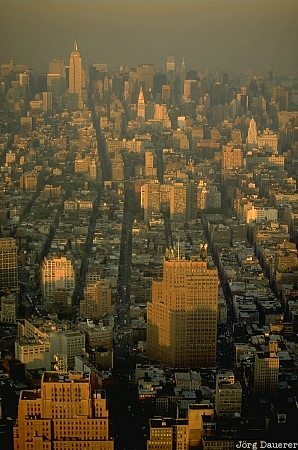 The maze of streets and buildings that make up Midtown and Uptown Manhattan dominated by the Empire State Building (on the upper left-hand side of the image) seen from the top of the World Trade Center. Manhattan is in New York City, New York on the east coast of the United States. This photo was taken in the late afternoon of a sunny day in June of 1995.